The former Beatle was promoted to the rank of officer by President Francois Hollande in a private ceremony in Paris. McCartney, 70, has joined the likes of singers Barbra Streisand and Liza Minnelli, who received the honour from former President Nicolas Sarkozy. Mr Hollande decorated McCartney with the Legion of Honour in front of an audience of family and friends gathered at the Elysee Palace. After receiving the award, Sir Paul said: "It is such an honour to be awarded this." 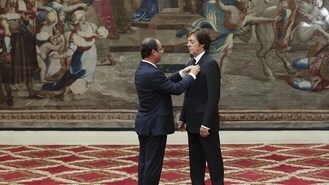 Mr Hollande praised McCartney's contribution to the arts and joked that he preferred the Beatles to the Rolling Stones. The French leader also said he favoured McCartney over fellow Beatle John Lennon when he was younger. The award is usually only given to French nationals and mainly those who have served in military or civil life. It was established by Napoleon Bonaparte in 1802. Past British recipients have included Queen Elizabeth II, actor Sir Laurence Olivier, author Graham Greene and war veteran Henry Allingham. McCartney recently performed to a global audience at the opening ceremony of the London 2012 Olympic Games.